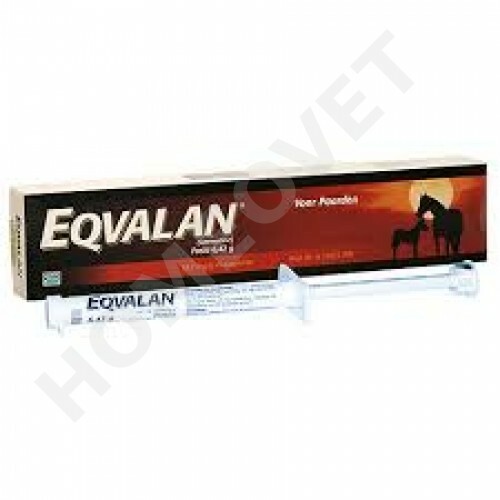 Eqvalan Horse Wormer Oral paste for horses containing 1.87% ivermectin. For the treatment and control of adult and immature roundworms, lungworms and bots including those resistant to benzimidazole based wormers. Can be used safely in pregnant mares and young foals. It comes in syringe form ; syringe will treat up to 600KG bodyweight. Active substance: Ivermectin: 1.87% w/w. Neck threadworms (microfilariae), Onchocerca spp. Underdosing, which may be due to underestimation of body weight, misadministration of the product, or lack of calibration of the dosing device. Parasite control program; All horses and donkeys should be included in a regular parasite control program, with particular attention being paid to mares, foals and yearlings. Foals should be treated initially at 6 to 8 weeks of age, and routine treatment repeated as appropriate. Do not store above 25 °C. Protect from light. EXTREMELY DANGEROUS TO FISH AND AQUATIC LIFE. Do not contaminate ponds, waterways or ditches with the product or used container. Any unused product or waste materials derived from such products should be disposed of in accordance with local requirements.